Catherine Woolley was born in Chicago to Edward Mott and Anna Lazelle (Thayer) Woolley. She grew up in Passaic, New Jersey where her father was a newspaperman. After first attending Barnard College in New York, Ms. Woolley earned her bachelor's degree from the University of California at Los Angeles in 1927. After college, she worked as an editor and public relations writer in New York returning to her parents' home in Passaic in the 1930s during the Great Depression. A prolific writer of over eighty books, Ms. Woolley published so many children's books that her publisher recommended using a pen name for some of her works. She chose the name, Jane Thayer - her grandmother's name - which she used for the many picture books she wrote. 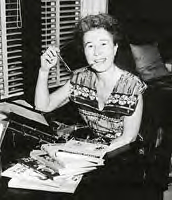 In the early 1960s, Ms. Woolley moved to Truro, Massachusetts where she wrote book after book on an old Remington typewriter. Ms. Woolley was an easily recognized figure at writing and book events in Truro. She helped start a book club, worked with the Friends of the Truro Library, taught at writing workshops, and held story hours at the library. The children's room in the Truro library is named after Catherine Woolley. Though never having had children of her own, Ms. Woolley had a special gift for communicating to her young readers. Her works have been and continue to be enjoyed by many generations. Parents today have the joy of sharing the books of Catherine Woolley with their own children. The Ginnie and Geneva series is a favorite among Ms. Woolley's readers. Below is a listing by date of original publication along with descriptions of each story in this classic series. After traveling with her mother and father for the first nine years of her life, Georgina Fellows, known as Ginnie, is able to attend school for the first time. Ginnie is shy and feels a bit timid about joining the fourth grade class at Lincoln Grammar School . After a few ups and downs, Ginnie ultimately makes friends with her classmates. Ginnie's best friend is mischievous tomboy, Geneva Porter. Her other close friend, Anna, is an orphan who is adopted by Ginnie's grandmother. The series has a lovely, warm feeling of family, friends, and a happy state of well being. As Ginnie and Geneva mature, they begin exploring activities such as babysitting, cooking, and solving mysteries! Ginnie and Geneva . Ginnie has not gone to school as early as other children, but because of her mother's lessons, she is ready for the fourth grade. Although she has looked forward to school eagerly, it is a disappointment at first, for Ginnie has never played games or roller skated or had any practice in making friends with boys and girls. Geneva Porter, the most confident and popular girl in the class, bothers Ginnie most of all, as Geneva loves to tease. But Ginnie, who finds it hard to defend herself, has no trouble at all in standing up for her new friend. This is a warm and understanding story of children learning to get along with each other and having a wonderful time as they do! Ginnie and the New Girl. Ginnie and Geneva are best friends - they walk to and from school together every day and play together every afternoon. Geneva 's companionship means a great deal to the less self-confident Ginnie - until the new girl comes. Then all Geneva 's time and interest seems to be devoted to Marcia, and Ginnie feels lonely and hurt. At first she is miserable, but gradually she develops other resources. Ginnie finds out what happens when she seeks her own solutions to her problems. Ginnie and the Cooking Contest. When Ginnie spots the newspaper headline announcing a juvenile cooking contest, she is immediately fired with enthusiasm and determination to win first prize, a trip to Washington , D. C. For weeks she pored over a multitude of cookbooks trying to find the ideal menu to submit and a superlative recipe to prepare the day of the contest. Although an experienced cook for her age, Ginnie begins to lose confidence as she samples her friends' mouth-watering dishes and cannot decide on her own entry. Even with her plans settled, Ginnie finds she has not allowed enough time to prepare her material. How she manages to enter the contest on time, and what happens then, makes a suspenseful climax to a warm, appealing story. Ginnie and the Wedding Bells. Ginnie is delighted when she is asked to be a junior bridesmaid. But her joy is short-lived. Her first shock comes minutes after reading the invitation. A hard-packed snowball, tossed in fun by her friend Geneva , strikes her on the cheekbone, grazing her eye - which begins to turn black. A bridesmaid with a black eye! Impossible! There is nothing to do but to cancel plans for joining the wedding party. That calamity, however, is only the beginning. One crisis follows on the heels of another as Ginnie and her parents arrange to attend the ceremony as guests of the groom. The Christmas wedding is to be held in Nantucket . They plan to go by plane, but the weather is uncertain. Then Ginnie seems to be coming down with a virus - and at the last minute, the cat has kittens, which cannot be found! Will Ginnie and her family be able to get to the wedding after all? Ginnie and the Mystery Cat. When Ginnie hears that her parents are planning a tour of Europe , she begs to go along. And taking along best friend, Geneva , makes the trip sound all the more exciting. Not long after they arrive, Ginnie notices suspicious things happening wherever they go. Clutching the good luck cat figurine she had acquired, she dismisses her uneasiness. From Portugal to Spain then on to historic Greece , the trip provides one new experience after another. The girls visit museums such as the Prado in Madrid , enjoy horse-drawn buggy rides through Old World city quarters, and of course, sample delicious new foods. Nevertheless, the nagging idea lurks that the party is being followed. When a confrontation occurs, Ginnie is most surprised to find herself a heroine! Ginnie and the Mystery Light. Ginnie is invited to spend the Christmas holidays with Geneva in the South. Though Ginnie hopes for excitement, she doesn't bargain for anything as spooky as the mystery light on Lonesome Bay Road . Still, she is determined to find out what causes it. Is it the ghost of a Civil War slave looking for his wife? Is it related to black magic, voodoo, root doctors? And who is the flamboyant Doctor Turkey ? Before Ginnie helps to solve the baffling riddle, she learns something of the nature of superstition, ignorance, fear - and evil. Based on an actual experience of the author, in which she participated in a university-sponsored investigation of a similar legendary light, this story is full of surprises and will keep its readers guessing from start to finish.